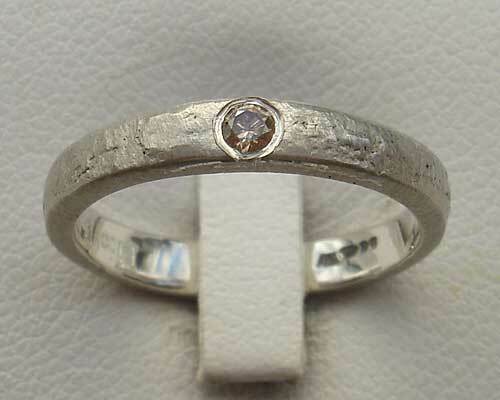 Unusual Brown Diamond Silver Engagement Ring : LOVE2HAVE in the UK! Made in Cornwall, this unique women's unusual silver engagement ring is meticulously handcrafted the traditional way. The engagement ring is sand cast, and the grain of the sand is what creates the texture. This technique is not a conventional method although sand casting has been used for thousands of years and is still used a lot in industries today. The silver texture somewhat resembles that of pebbles found on beaches that have been washed smooth by the continuous motion of the tides over time. The ring is made from sterling silver and measures approximately 3mm wide and comes in a flat profile. There is no compromise in the unique design and high quality handcrafting just because the ring is silver. The texture reflects the natural cycles of the seashore and reminds us of coastal seascapes with its slightly pitted quality. 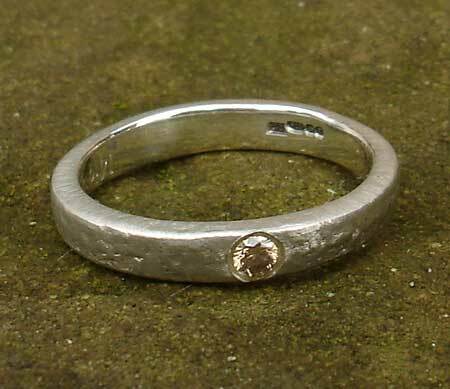 The silver surface has a soft and natural colour about it, and this engagement ring does look like a piece of jewellery that has washed up onto a British beach. The design is so striking because of the most unusual look and also because of the choice of the .04 carat brown diamond. The piece has a real rustic appearance, and the silver and brown reflect this. To add to the unique quality of this engagement ring the designer tells us that the silver used is recycled silver, a crucial factor in regards to today's efforts to encourage sustainable business practices that are not to the detriment of the planet. That's right; you can help save the world by shopping for your engagement rings at Love2Have. A matching 3mm width wedding band is also available, so please email us for further details. Precious stone(s) Available: 1 x .04ct/2.4mm round brown diamond.